The last couple of years I've attended the Shore Leave Con at the Hunt Valley Inn just north of Baltimore, Maryland. My group has reservations for this year's event, too. Since we booked our rooms, the facility has been purchased by Marriot and is now a Marriot Delta Hotel. The Shore Leave folks say all reservations have been transferred over to the Marriot system, but they encourage people to confirm their reservations nonetheless. Our reservations have been confirmed, but if you are planning to stay here please make sure you are in the Marriot system. The block of rooms assigned for Shore Leave guests is already full, so don't assume you're booked and end up with no place to stay! Shore Leave has been here for a number of years, and the facility is well suited for the convention. It will be interesting to see what, if any, changes Marriot makes—both this year and for any future conventions. I hope to blog a little again from the convention again this year, so I'll post whatever info I get on this matter. If you know of anyone attending Shore Leave 39, make sure they know about the change. And if they are staying at the hotel, ask them to confirm their reservations! This has been a public service announcement! One of the biggest problems I have is finding time to write. I realize I'm not the only budding writer in this bind, but I've come to the conclusion that something has to change or most of my works will be published both incomplete and posthumously. What I've decided is this: I will have to cut back on the amount of blogging I do. I still hope to post the occasional short/flash story or poem, and any new stuff I have published will go here, but I won't be detailing every moment of my life on these pages. Not that I do now, but you know what I mean. I hope. If you have any thoughts on this, or on your own blogging experience, please let me know! The manor had long fallen into disrepair. 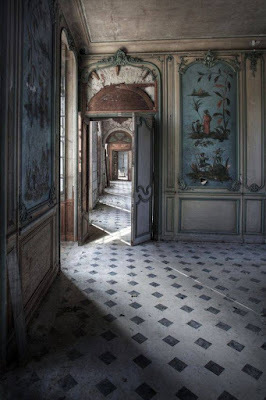 Its magnificent halls, with their ornate decorations now covered by a layer of dust, were silent—save for the rustle of leaves or wayward bird that gained entrance through one of the many broken windows. Here and there, plaster cracked, paint peeled, colors faded. The great house was slowly crumbling, returning the landscape to its natural state, with entwining vines climbing the stone walls, their white blossoms filling the gentle summer breeze with sweet perfume. The once-stately dwelling was gradually, though inexorably, fading from existence. So would she, Penelope believed. This melancholy thought consumed her days and haunted her nights. She had already stayed too long. Still, the familiarity of her childhood home brought her comfort. She couldn't bring herself to leave. Each room, each carved mantle, even the play of light through the hazy windows brought back a memory. Most of all, it was the views of the countryside that thrilled her heart. The great oaks in the distance, the fields stretching over rolling hills, the gardens near the house—it had all been a part of her life. To divert her mind from this sadness, Penelope took pleasure in her aimless wanderings among the rooms, delighting in the changing scenes as the days, the seasons, and even the years, passed. One room, however, remained unvisited. It was neither unique nor unusual in any way—merely a small, third-floor bedrooms in the northeast corner of the house that had seldom been used. From the lone window, however, one could spot the stone monuments of the family cemetery standing stoically on a small rise near the wood. The marble spires and obelisks, once brightly polished, now showed pitting and discoloration from age. Weeds sprouted from within the wrought iron fence that guarded the final resting place of her proud family. This disturbing reminder of how things return to nature was too much to bear. Therefore, the door was locked, the key tossed, and Penelope never again entered the room to preclude even the briefest glimpse of the cemetery in which she, too, was buried. A couple of weekends ago I attending a wedding. It's not something I do often. I think I went to one before, though my memory of it is vague. The timing of this particular celebration perplexed me. A wedding—in March—in Michigan? This must be madness, I thought. Disturbing images of my better half's family tree crept into mind. What other dark secrets await? The establishment where Marie had made reservations is part of the Michigan State University campus. The hotel is attached to the venue where the reception was to take place and not far from the church where the ceremony itself would occur. Convenient, we thought. We pulled into the hotel parking lot late in the evening, and certainly long after the sun had set. At least that is what I presume as we had not spied so much as a glimpse of the orange orb during our travels, though the amount of falling snow was now reduced to a few wayward flakes. "I'm glad the bad weather is over with," we both said. All we wanted was to settle into a cozy room, do a minimal amount of unpacking, and go to sleep. That blissful image was not to be, however. You see, to settle into a cozy room one must be able to enter said room. We loaded up a dolly with about half of our belongings3 and made our way to the room. Marie put the key card provided by the desk clerk into the slot and, when the indicator light turned green, pushed open the door—about 6 inches. She tried again, with similar results. Being a man, I immediately4 took charge. I slid the provided key card into the slot on the door and pushed it open to nearly 6.1 inches. A marked improvement, though still not adequate for the purposes of entry. Summoning all of my strength5, I took a brief run at the door (the hall was narrow) and pushed as hard as I could while Marie told me to shove it6. This action produced little improvement. Upon investigation, we determined that the door closure unit had fallen to a point where it blocked the door from fully opening. Forcing the hinged arm upward just a bit allowed us to open the door and gain access to the room. We rolled the dolly into the room as the door closed gently behind us. After emptying the dolly, we prepared to leave and fetch our remaining items. I grabbed the knob and pulled. The door opened about 6 inches. To make a long story short, we eventually unloaded all of our things into the new room to which we had been assigned. We sat back to take a quick breather before preparing to turn in. It had to be a quick breather because the room smelled so strongly of industrial-strength cleaner that the thought of requesting yet another room entered our minds. Instead, we opened a window. This confirmed to us that the temperature outside was indeed below freezing. Still, it was an improvement, and the odor eventually dissipated. As we settled in, from above we heard the sound of something rolling and then a muffled crash. Then footsteps. This scenario kept repeating until Marie took out the map of the complex and discovered our new room was directly under the check-in station. Every time a new guest arrived (or left) we were treated to a replay. At this point, we were too tired to care. Oddly enough, I slept well there7. The next morning, of course, brought more snow. 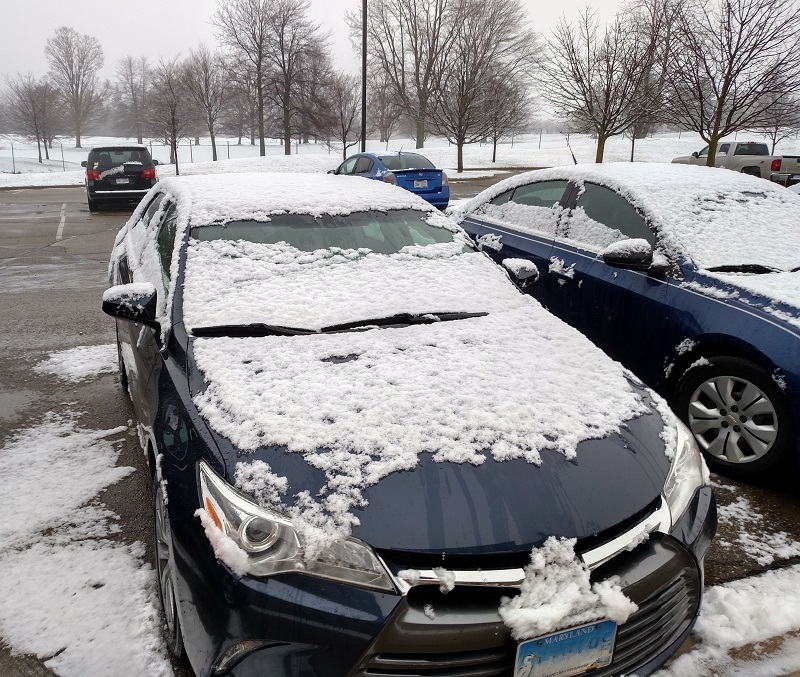 It may come as a surprise to many8 that it does snow in Michigan during the winter. Fortunately, the rain and rising temperatures melted most of it. Snow in Michigan - in the winter? After a quick snack for breakfast, it was time to get ready for the wedding. There was much consternation as to what would be the best outfit for each of us. You'd think we were the ones getting married. Although we'd brought a lot of clothing with us, much of the packing was done hurriedly9, so the final choices had to be made. Eventually, and fortunately, we made it out the door, though never with confidence about our wardrobe selections. The location chosen for the ceremony was St. Thomas Aquinas church. It's known for the huge stained-glass wall (not just a window or two) in the front of the building. And with a sharp pull, the knot was tied! Once the ceremony was over and all the official wedding pictures taken, the crowd went to the University Club for the reception. It is attached to the hotel were we stayed, so that was convenient. And even better—they were serving free Guiness. I might have to go to more of these wedding parties10. Eventually, they introduced the family members and, of course, the bride and groom. The Irish theme continued during the ongoing festivities. They brought in an Irish dance group to entertain until they opened the dance floor to the guests. I'd not seen this done before and it was quite nice. And don't tell anyone, but Marie and I danced (a little). It's okay. No one was injured. All this socializing stuff continued on well into the evening11. Eventually folks started drifting out. There would be a brunch the next morning, so it wasn't like they wouldn't see each other again. The brunch was held at a different location. I don't know why. But they served about a dozen different types of donuts and pastries, and this being Michigan, pasties. Marie and I split one. After the brunch festivities were over, we had a little time before rejoining the bride and groom while they opened gifts. With the weather improving, Marie's sister and her husband were kind enough to give us a brief tour of Lansing and the MSU campus area. It's not that big of a city, so a brief tour was enough. As you can see, we stopped by the capitol building in Lansing. We didn't go in, though12. I would have knocked on the door, but it didn't look like anyone was home. As we drove around the MSU campus, we made the obligatory stop by Sparty, the University's mascot. Technically, this is "Sparty II" as the original (not made of bronze) is displayed indoors to protect it from harm. We decided to take a picture here for no other reason than to prove I was in Michigan. It took a while, however, because we weren't the only ones with that idea. So, here we are—me and Sparty, just hangin'13. The highlight of the tour was a stop at the MSU Dairy Store. In addition to ice cream (I got a Gopher S'Mores cone14), we made the required purchase of chocolate cheese15. Yes, it looks exactly like you'd think it would. You know, with all these pictures of Michigan State, some folks might get the mistaken impression I attended this fine institution16. No, nothing so grand for me. But I have to admit, a certificate from here would probably be more impressive than the one I got for my National Radio Institute home-study course17. After leaving MSU, we went to watch the happy couple open their wedding gifts. You're not officially married until you get kitchen appliances for gifts. They also announced they were going to honeymoon in Ireland. After all the Irish stuff during the ceremony and reception, this came as no surprise. The best moment of the evening came when opening one of the gifts—a hand-made quilt. After the oohs and ahs were finished, Dominic (the husband) decided to put it back in the cardboard box in which it arrived. So far, so good. At that point, he proceeded to wad it up like an old tissue. Not so good. There arose a collective gasp from every woman in the room18. 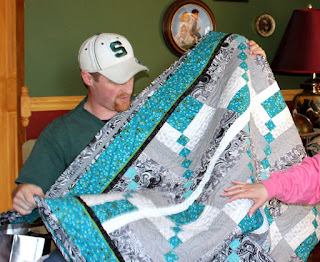 He received a lesson on the proper folding of quilts I'm sure he'll never forget. They next day it was time to head back home. Always up for a little adventure, we altered our route to take us by Lake Eerie—I mean Erie. Forgive me, it's an honest mistake. We took the following picture just a few miles west of Vermilion. Surely it looks better in the summer19. The water was an interesting color of gray, somewhat akin to the shade of fluid ejected from your washing machine after doing full load. It seems the wildlife doesn't mind. We caught up with these geese at Sherod Park. When I say we loaded up the car, that is not an exaggeration. Had the trip lasted a day longer we would have required an upgrade to a medium-sized, diesel-powered truck. We asked if she needed assistance. Her footwear was definitely inappropriate for the weather. Due to the quantity involved, the term belongings seems more appropriate than luggage. Inertia, then, if you insist. I may not have strength, but as my girth increases, so does the amount of inertia my body can generate. I believe there is a formula for this. Something like Ici = (Adp * Wb)2, where Ici = inertia of charging idiot, Adp = avoirdupois, and Wb = the width of applicable backside in centimeters. Squared, of course. I can't say mass because I'm not a priest (rim shot, please). My memory is not entirely clear on the order of these events. It was just like being at work. Perhaps horridly is the correct term here. To be specific, Irish wedding parties. Fortunately, so did the Guiness, which may explain why I was dancing. We didn't see any lights on, so we left. I put a note on the door: "Sorry, we missed you!" I'm not sure who we missed, but maybe we can stop by again sometime. Then they'll be sorry. From the looks of things, Sparty hangs a little better than me, but this is a PG-Rated blog, so enough said. I got a single scoop, but it was more than generous. You never know when you might need more inertia. As a note for future reference, there is usually a line, a large crowd, and a single-room restroom which also has a line (different direction, of course). Forewarned is forearmed—and, most likely, relieved. No, I haven't tasted it yet. I've been in a lot of institutions, but this wasn't one of them. There was a lot of gasping. I believe the windows actually bowed in as atmospheric pressure attempted to equalize. And, in truth, folding is just wadding in a very orderly manner. Well, it is to a man. Please-someone from Ohio-post a comment and assure me it looks better than this in the summer. The rest of your state we saw seemed very nice.